kim watson ★ design ★ papercraft: Oh joy!!! Joy comes in many forms......we had plenty of them this weekend. We decided on Friday, that this weekend would be a 'holiday' weekend. Our original plan was to find a little B&B to stay in for two nights but short notice threw the plans out and we were unable to find anywhere that had space available. But we made the most of it anyway and had a fine time!!! 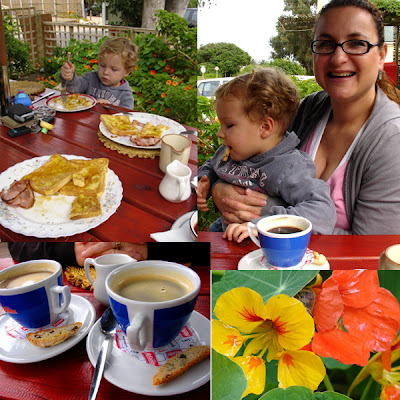 Our FIRST JOY was in the form of a leisurely brekkie under the trees at our fav coffee shoppe, with French toast,bacon & unbelievable coffee. The highlight was Maxi asking the waitress if he could have : " Biscotti, please!" .....excuse et moi! Our SECOND JOY was being able to visit a Farmers Market nearby. Not only were we able to sample delicious home bakes from various stalls but we were able to buy and sample fresh organic vegetables grown by the lovely people we met at the market. We were blown away by a group of African ladies who create art from other peoples garbage. It was the most beautiful thing to see up close, the colours were brilliant and the design incredibly ingenious. Max was fascinated by the color Tree, he found tucked inside an inner courtyard. Wow! He also got an opportunity to visit with a real live brass band. They were the live music for the affair and were so supportive of Maxi's love of the saxophones. They put him on stage with them & surprisingly enough Max was overcome by shyness. He did this little 'finger-in-the-cheek' thing for all the photographs. Sweet hey? The view from the farm across the valley is nothing short of amazing!! The weather was questionable, cold & yet so full of contrast that it was impossible not to be in awe of God's creativity & to think he did all of this that we might find JOY in it. 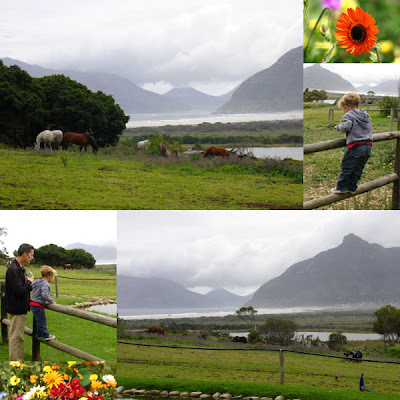 We had an unbelievable relaxing, family time that we needed so badly!!! Tersh is working ridiculous hours & I am struggling to adjust to my new life. Our need for 'us' time is paramount for our sanity but in the busy-ness of life, it is easier said than done. So this weekend was long overdue! 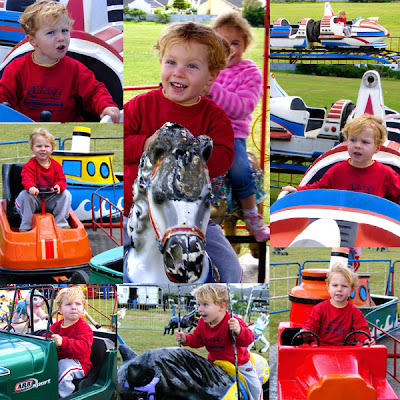 Our THIRD JOY came in the form of a Fun Fair organised at one of the Primary Schools in a neighboring suburb. It was FREEZING and we were horribly under dressed but for the sake of a little boy completely overjoyed to see so many rides to go on.....it was worth the hypothermia. He was like a Eveready battery bunny.....bouncing & dashing to & fro, trying to decide which ride to go on next. The elation on his face when he got onto those carousel horses is something I will never forget. Oh to be young enough again, not to be affected by the external things which can so easily trap......he never saw the chipped paint, the rusty wheels, the missing ears, the awful tinny music, the taped up gates. Years of wear & tear from 1000's of tiny bottoms eager & bursting with the joy of childhood experience. He just saw it for what it was.....his first Fun Fair & it was Fun personified!!!! Flip!!! I am loving being this child's Mama. As hard as it can be, moments like these are the fuel my soul needs to get through the next batch of challenges I am sure I will experience as a first time Mama. Thanks for stopping in to read my blog guys and double thanks to all those who had the kindness of heart to leave me a comment. I love knowing who stopped in. Tags: Family joy, Fun weekends, Our Amazing God. WHat beautiful pictures, I love the collages... :) I too am ever blown away by the beauty God made and lets us live amongst! 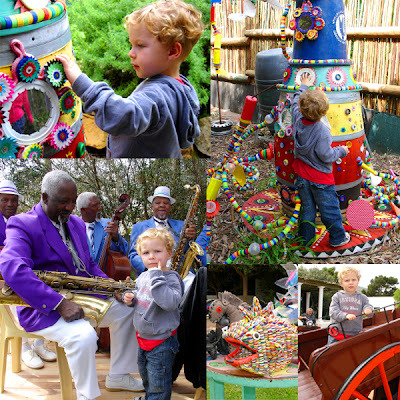 I love your photos, they capture the colours, sights, life and joy on a little guy's face - well done. Something to hold tight to my "first baby" is 14 now, taller than me with braces and attitude, but the feeling of enthusiasm for life is priceless.